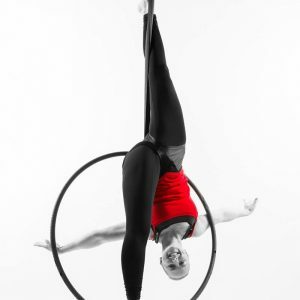 At Aerial Hoop Classes you will learn…..
Aerial hoop moves, tricks, skills, combinations and routines. Classes are taught on an aerial hoop also known as a ring, circle, or lyra. The hoop is made out of steel and suspended from the ceiling. Our hoops vary in height which allows us to teach a variety of abilities. Attending aerial hoop classes will increase strength in the muscles necessary to perform the moves. To help students build the necessary strength to perform moves and routines in the aerial hoop we also include strength and condition exercises alongside practicing aerial hoop moves, tricks and combinations. Over the course of each 6 week term expect to build moves together to build on each week and work towards performing a routine performed to music with the students in your class. Syllabus At Blush Dance Studios we aim to challenge and support your progress through all stages. Our classes cater for all levels from complete beginner to professional performers. Our team work to a bespoke syllabus of moves and routines which support students through their skills ensuring they are suitable challenged along the way and learn in a safe and effective way. Our syllabus has 6 levels. Level 1 – Beginners. Level 1 Aerial Hoop classes are great for those brand new to aerial hoop. They will teach you basic skills and foundation moves in and under the hoop. This includes routines using foundation moves and transitions. They are open to all levels, shapes and sizes, no aerial or strength experience is necessary to start training with this equipment. Level 2 – Amateur. Level 2 Aerial Hoop classes are ideal for students who have achieved all moves at level 1 and have built foundations in aerial strength and knowledge. Students who are ready to challenge their strengths and skills a little further with more complicated tricks which require a base level of strength and skill. Level 3 – Intermediate. Level 3 Aerial Hoop classes are ideal for students with confidence in the basic aerial moves and are ready to focus on more challenging tricks and combinations. The classes will use skills and combinations to build towards routines. Classes also include technique and creative/choreography work. Level 4 – Advanced Intermediate. Level 4 Aerial Hoop classes are for students who are confident with the foundation intermediate skills and are looking to learn more challenging tricks, combinations and choreography. Top bar moves which require a foundation knowledge in basic intermediate tricks and drops and rolls with a little more bite. Level 5 – Advanced. Level 5 Aerial Hoop classes are designed for the students who are confident at all beginner – intermediate moves and combinations. The students have passed levels 1-4 of blush aerial hoop syllabus. In Level 5 classes we teach drops, rolls and more complex moves, tricks and routines on the hoop. We teach how to freestyle and create your own choreography to begin your own performance career for fun or for competitions or professional performance. Level 6 – Elite. Level 5 Aerial Hoop classes are great for students who are looking to move to the professional arena or are very confident at all moves up to and including level 5. At this level students will learn difficult tricks, complicated combinations and choreography that require a high level of strength, and flexibility. What do I wear to Aerial Hoop Classes? Get kitted out for class in leggings, T-shirts, vest tops, shorts (over leggings) two pairs of leggings or long socks/leg warmers will protect your backs of knees and ankles from bumps and bruises that are an inevitable part of training in aerial hoop/lyra. We wear bare feet and also socks for training in the hoop, Bring a long sleeved top for warm up. Can I come to a taster to try it out? Our aerial hoop classes run in terms of 6 weeks, you can opt to purchase 4 classes out of the 6 week term, pay for all 6, or pay for 12 (two terms or twice per week) the more classes you book in a block, the cheaper per class. For a full price list see our bookings page. At what age can you join classes? For adults aerial hoop classes students can join from 16 years old. We teach from 6 years and up in our Aerial Kids Club classes and Aerial circus parties.